Package coffee, tea, vitamins, spices and more in these attractive Silver Oval Window Zipper Pouch Bags. At 3 1/8" x 2" x 5 1/8", these bags have a usable space of 2 11/16" x 1 3/4" x 3 3/4" and hold 1oz/28g. Perfect for single servings or sample products. 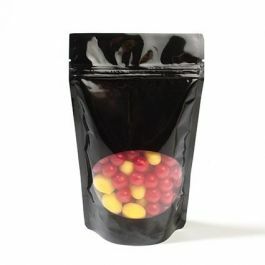 A 2" x 1 3/8" crystal clear window allows inner contents to show through the bag. This item is currently sold with NO HANG HOLE. Due to popular demand, it will soon come stock with a round hang hole. Check this table to see when it will be available with the hang hole. ZBGO1S is our Silver Oval Window Zipper Pouch Bags that holds 1oz/57g, ideal for single-serve portions. 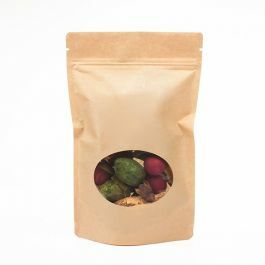 FIll these 3 1/8" x 2" x 5 1/8" stand-up pouches with coffee, tea, specialty treats, jerky, spices, and bath salts. These bags have inner dimensions of 2 11/16" x 1 3/4" x 3 3/4" with a crystal clear window that measures 2" x 1 3/8" that showcases your product. Constructed of laminated materials, these silver foil pouches have a built-in barrier to hold in aromas and flavors. The reclosable zipper and tear notches are designed for maximum customer satisfaction. Tear notches allow access to contents if pouches are heat sealed. These food safe, 4.8 mil bags work great for specialty products or niche markets.